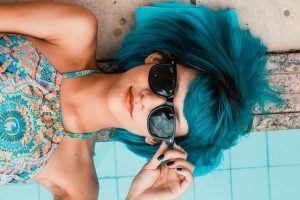 Americans have a tendency to exaggerate—everything is gorgeous,” you’re a genius,” you’re terribly depressed,” you adore” this and just love” that. The French are more negative and restrained; excess of this sort can be seen as very American and somewhat vulgar. If you serve a delicious dish to a French guest, it’s never delicieux or magnifique. High praise would be pas mal (not bad). Well, I’m going to be very American (I often am) about this classic French dessert: floating island. I adore it because it’s so light after a big dinner and yet beautiful and profoundly impressive when presented in an oversize glass bowl. I love the soft, white peaks of cooked meringue floating like mini icebergs in the rich, yellow crème anglaise. If you’ve never made it, have no fear; I make it so often that I’ve developed a quick, simple method. By cooking the meringue in the same milk that’s used to make the crème anglaise, the fussiest steps can be eliminated. Omit the vanilla bean if you don’t plan to use the milk to make crème anglaise. Keep in mind, any trouble you take with this nearly perfect expression of French elegance is worth it. After cooking each side, scoop them out and place them on a large, cool plate or tray. (You may reserve 2 cups of the milk to make crème anglaise) When you’re ready to serve, pour the crème anglaise into a wide bowl. You want as much space as possible to float the meringues on top. Place each meringue carefully on the surface of the crème anglaise until it looks like you have a sea of little icebergs floating on the crème anglaise. An hour before serving, make a dark caramel. To make the caramel set a small pot on low heat with the remaining 1 cup of sugar and the water. Cook without stirring, until the mixture becomes quite dark. Stop the cooking process by dipping the bottom of the pot in cold water before you smell burnt sugar. Drizzle the hot caramel over the islands in long streaks. The caramel looks pretty and solidifies as it hits the cold islands and crème anglaise, giving the dessert a sugary crunch. 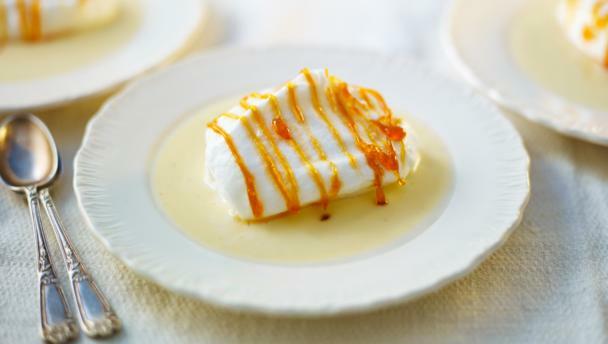 Crème anglaise is the base for most ice creams and for many French and American desserts, including classic Floating Island. I prefer to add less sugar to this decadent sauce than most recipes call for, so you may find my version lighter and more versatile than you expect. Served with fresh berries, stewed fruit, a crisp, or a crumble, it makes even the most rustic dessert elegant. If you are making Floating Island, use milk from that recipe and omit the vanilla here. In a small pot set over medium heat, scald the milk along with the vanilla bean. Set aside to steep. In a separate bowl, whisk together the yolks and sugar until mixed but not beaten. When the milk has cooled off a bit, pour a little of it into the egg mixture, whisking vigorously as you pour. Add this sugar-egg mixture to the remaining milk in the pan, whisking all the while. Cook over very low heat, mixing continually with a silicone spatula or wooden spoon until the custard thickens enough to coat the back of the spatula or spoon, 8 to 10 minutes. Strain through a fine-mesh sieve into a bowl set over ice, stirring occasionally. Serve warm or at room temperature. Refrigerate in a tightly sealed container for up to a week.